Searching for a new apartment home involves much more than just finding the right location – it also involves finding the right price. In the next year, industry experts are estimating that rent prices across the country will appreciate 1.7 percent. According to Zillow, the areas that are popular for jobs in technology, such as Seattle and San Francisco, will increase quickly in the next few months. At Lincoln Property Company, our years of expertise and experience allow us to create valuable resources for the multifamily industry and quality communities to fit renters’ unique lifestyles. Our Official 2017 U.S. 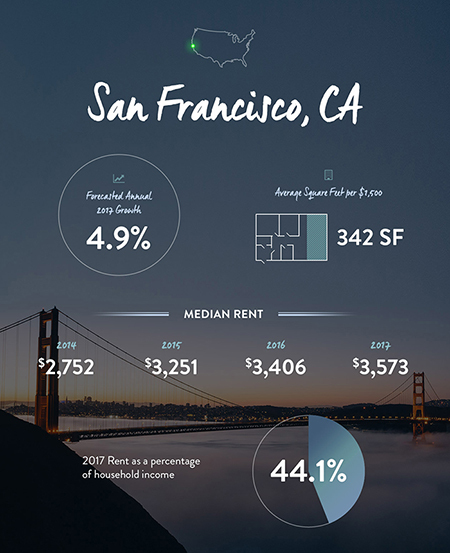 Rent Forecast is a helpful, interactive infographic that evaluates rent appreciation data, helping you explore forecasted rent trends before entering a new market. You can compare and contrast rent prices in cities such as Los Angeles, San Francisco, Boston, and Denver, to name a few. An example of the rent information you can view by city. To see more click here. Austin, TX: Due to a diversified economy and its trendy reputation, this area is on the most-wanted list for many domestic investors. Dallas/Fort Worth, TX: The low cost of living, exceptional public transportation system, and growth in the medical and technology fields are attractive to both renters and potential investors. Portland, OR: With income levels rising and affordable rent prices in the metro area, Portland continues to provide a higher quality of life to new residents. Seattle, WA: The addition of technology firms in the area has created a demand for both single family and multifamily housing, making Seattle a new hotspot for tech professionals. Los Angeles, CA: As the mass transit system continues to see improvement, there are many opportunities for development near the evolving transit line. Nashville, TN: With new jobs being added to the health care, technology, and tourism fields everyday, local graduates and young adults are flocking to this vibrant city. Raleigh/Durham, NC: New lifestyle options such as live/play communities and campus-style business parks are encouraging steps towards improvement in all areas of Raleigh/Durham. Orange County, CA: Close to Los Angeles and Long Beach, this area is considered an “affordable tech location” compared to the more well-known tech cities in Northern California. Charlotte, NC: Known for its attractive employment growth and strong core economy, Charlotte has seen a steady increase of rental options in both the metro area and suburbs. San Francisco, CA: After experiencing a boom in economic growth and rise in housing costs, San Francisco is still projected to have a strong 2017 in the real estate market. 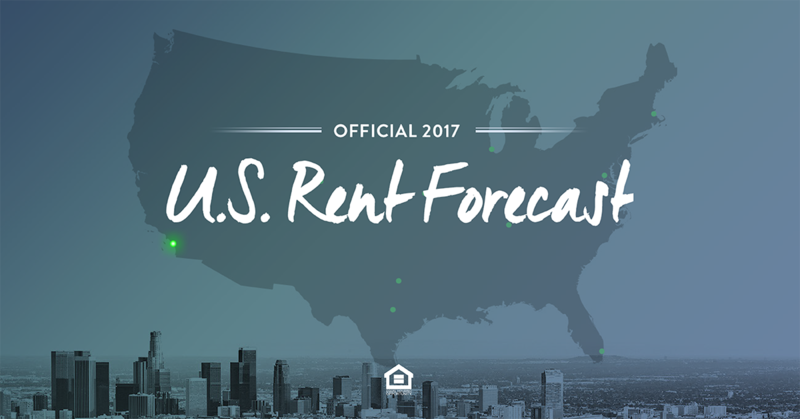 To learn more about rent forecasts and market trends, check out our interactive infographic here.